To recognize the achievements of individuals who promote the objectives and purposes of the Adjutant General’s Corps, Adjutant General’s Corps Regimental Association (AGCRA), or Human Resources professional as set forth in the Constitution and Bylaws of the Association. 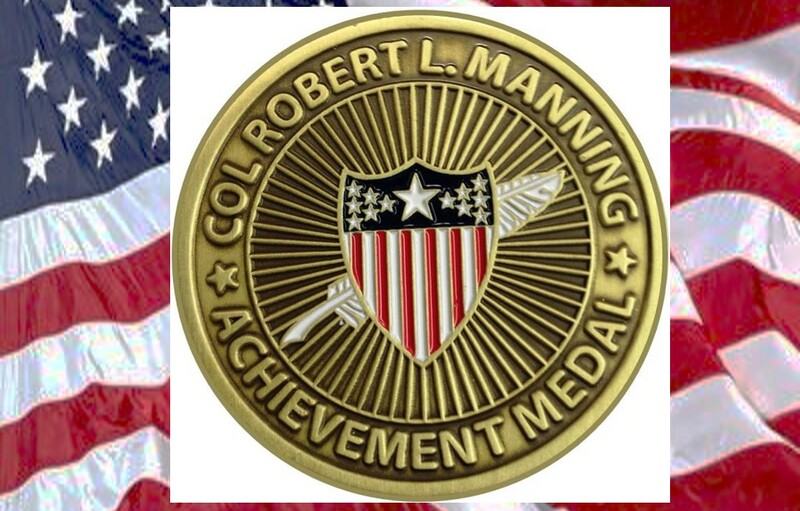 The COL Robert L. Manning Achievement Medal is awarded for achievement of a lesser degree than required for award of the Horatio Gates Medals. Any person who is a member in good standing of the Association, and who is a member of the Adjutant General’s Corps, or affiliated with the Adjutant General’s Corps or other Human Resources professional, when the recommendation is submitted. Personnel may not receive this award more than twice. As established by the Association’s Constitution and By-Laws and in keeping with the AGCRA goals that members be recognized for their accomplishments. Approval authority lies with the following: President of the National Executive Council, all Association Chapter Presidents (Chapter must be active and in good standing), and by downgrade authority by the National Executive Council (majority vote required). At the request of Chapter Presidents, the AGCRA National Executive Council created an award to recognize contributions to the Adjutant General’s Corps, AGCRA, or other Human Resources professional. COL Robert L. Manning was the 29th Chief of the Adjutant General’s Corps, Commandant of the Adjutant General School, Chief of Army Bands, and President of the AGCRA National Executive Council. His leadership reenergized the Achievement Medal across the Army and Association. The medal was renamed the COL Robert L. Manning Achievement Medal in May 2013 to recognize COL Manning’s significant contributions to AGCRA. $20.00, borne by the recommending authority. Any person having firsthand knowledge of an individual’s achievement which meets the award criteria can recommend that individual for this award. The local Chapter President will review and approve/disapprove all recommendations. All recommendations for Achievement Medal, in memorandum format, will then be forwarded to the AGCRA Vice-President for Awards to verify membership status and preparation of the certificate and medal. If no Association Chapter is available, the award recommendation will be forwarded to the AGCRA Vice-President for Awards for processing and approval consideration by the Association President. If approved by the local Chapter President, or if no Association Chapter is available, the recommendation will be forwarded by email (preferred method) to awards@agcra.com or mailed to the Adjutant General’s Corps Regimental Association, ATTN: VP for Awards, PO Box 10026, Fort Jackson, SC 29207-0026 as early as possible, but not later than 30 days prior to the requested presentation date. Membership will be verified and the certificate will be prepared and forwarded along with the medal for presentation. The local Chapter President will sign the certificate. If there is no local Chapter, the AGCRA President will approve or disapprove the recommendation after membership verification. The Association President will sign the certificate and the medal will be forwarded for presentation. Once the award has been approved, payment may be made by check (payable to the AG Corps Regimental Association) or credit card. Credit card transaction can only be processed by the AGCRA VP for Awards.